In my studies of historical figures, I’ve reserved a special spot in my heart for those people whose lived their lives, for lack of a better word, “awesomely”. My criterion for such “awesome” people is to imagine them arriving in the afterlife: would they get a standing ovation for how they lived? It isn’t enough to have just been wildly successful in life, either; the people on my list have had a positive influence on others, going out of their way to make the world a better place. Two examples come to mind. The first of these is Annie Oakley (1860-1926), the American sharpshooter who rose above a troubled childhood to become one of the most famed entertainers of her day. She was also generous with her wealth, and promoted women’s rights and supported many orphans, widows and young women. The second example is Josephine Baker (1906-1975), an African-American dancer and singer who started life in poverty but found massive fame in France and became the first African-American woman to star in a major motion picture. She adopted numerous children to balance her own childhood, used her celebrity to work effectively as a spy against the Nazis in World War II, and supported the civil rights movement and the NAACP. Both of these women led lives that just make you pause and go, “wow”. It is premature and presumptuous of me to add someone to this list of awesomeness whose career is still ongoing, but after finishing Mireya Mayor’s memoir, Pink Boots and a Machete, I had that same “wow” moment. Mayor has led a remarkable life so far, and her memoir is filled with events that are alternately fascinating, amazing, touching and horrifying! For those not familiar with Mayor, she is a PhD anthropologist who is currently a National Geographic Explorer and a correspondent for the National Geographic channel. Since beginning her studies, her research and work has led her to some of the most remote and dangerous places in the world, including a recreation of the trek of H.M. Stanley across Africa in search of David Livingstone! She has also made remarkable discoveries, most notably finding the smallest mouse lemur in Madacasgar, and worked to get the previously unknown species’ habitat protected by the government. Pink Boots describes Mayor’s journey from her childhood as the daughter of a refugee of Castro’s Cuba to her achievements as a world-class explorer (and mother). Along the way, she was a cheerleader for the Miami Dolphins (I first learned about her during the “Science Cheerleader” kerfuffle of last year) before finding her true passion studying the natural world. Her memoir doesn’t disappoint! Mayor has been in some truly freaky situations (including a plane crash in the Congo) and has endured hardships in the wild that would have (and has) broken many people. Readers should steel themselves for discussions of some of the truly freaky parasites that are an unavoidable hazard of the tropics. The vivid descriptions of life in the wild are fascinating and in themselves well worth the price of the book. The necessity of wildlife conservation is also a recurring and important theme throughout the book. Mireya Mayor is a somewhat fascinating individual: she personally smashes to pieces at least four negative female stereotypes. Think cheerleaders are brainless? This cheerleader is a PhD anthropologist and Fulbright scholar. Think women can’t do important science? Mayor made a major discovery of an important lemur species. Think women can’t be tough? Mayor has recreated expeditions that have literally killed numerous travelers in the past. Think women can’t be girly and tough? Mayor wears pink boots into the jungle, and packs a little black dress for special occasions! In the end, Mireya Mayor’s memoir is a fascinating story that should appeal to anyone interested in science, nature, and adventure — as well as pink boots! * For my part, I found the chapter on “The Vain Girl’s Guide to Survival” as interesting as every other. This entry was posted in General science, Women in science. Bookmark the permalink. Ellen had to read a biography a few weeks ago for her English class. I wish I had known about this book–it would have been perfect. Yes, I really needed to review it sooner! That’s okay–I am sure she will have to read more biographies before she gets out of high school. We’ll catch it next time. P.S. I’ll probably be reading this one. 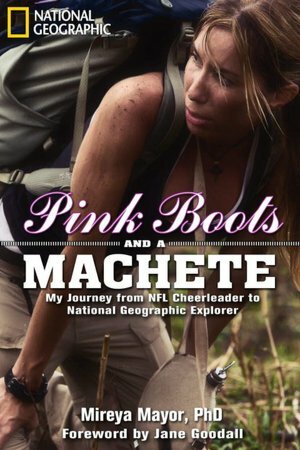 Wow, NFL cheerleader with a PHD who is a survivalist? Is she still single?